Not really sure if this will work for this challenge, as I just raised the embossed panel and added a paper covered button. 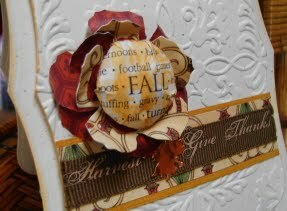 Regardless it’s a beautiful fall card. I only used one stamp from Hero Arts. I love your paper covered button, this is such a great idea and it looks amazing. It works very well with the embossing. holy moley, beautiful cards! love the embossing and covered brad! 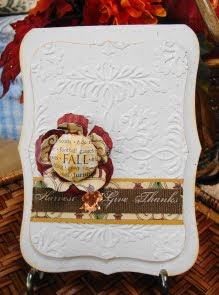 I love the contrast with the white and the rich fall tones! Lovely card! Vada, both are just beautiful! Love what you did with the flower! I wish Fall would hurry up and get here! Have a nice day!